Although there have been a number of recordings coupling Wagner’s two early symphonies (that is, including the fragmentary later work in E) only one is currently listed on Archiv: that conducted by Neeme Järvi for Chandos, which I reviewed for this site when it first appeared back in 2012. There are a number of alternative readings of the earlier complete Symphony in C, but it makes eminent sense to couple the two products of Wagner’s symphonic muse together on disc. Surprisingly the back cover of this Naxos CD gives patently incorrect dates for these two works; the informative booklet note by Katy Hamilton correctly ascribes Wagner’s work on the incomplete symphony to the period between August and September 1834 (not 1832-4 as given on the CD insert) and also notes that the completed work was given its first performance in December 1832 (which would make it impossible for the symphony to have been written in 1834 as the insert proclaims). For the sake of avoidance of confusion, I will refer in this review to the completed C major symphony as the First Symphony and the fragmentary E major one as the Second. The First Symphony languished after its first Leipzig performance in 1832, and four years later Wagner sent the score to Mendelssohn in the hope that he might schedule it for a further outing with the Gewandhaus Orchestra. There it vanished. It was not to be found among Mendelssohn’s papers at his death in 1847, and when Wagner instituted a search for it in 1876 it could only be reconstructed from a set of orchestral parts – which he undertook in 1878, making a number of cuts and revisions for a second performance given in 1882. As I remarked when reviewing the Järvi disc I have a soft spot for this symphony, worthy of comparison with similarly Beethoven-influenced symphonies by Schubert and Schumann, and have ranked it highly ever since I first encountered it in a barbarically coarse performance on Saga where it was incongruously coupled with an even less recommendable version of Bruckner’s Second Symphony issued in the 1960s. 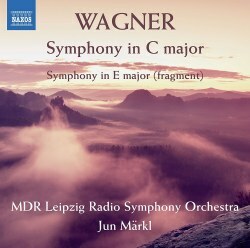 As I have already mentioned, it makes sense to couple the Wagner First with the fragmentary Second on CD; and this was first done on a Denon CD by Hiroko Wakasugi and the Tokyo Metropolitan Symphony Orchestra in a rather over-resonant recording which seems to have disappeared from the current catalogues although one solitary second-hand copy is currently listed on Amazon at the absolutely incredible price of £256.37. The Second Symphony was only ever written out by Wagner in short score, and after the composer’s death Cosima Wagner passed this manuscript to Felix Mottl asking him to complete the orchestration and round out the clearly incomplete second movement. Mottl did this most effectively, but since the manuscript was sold in 1913 and subsequently vanished it is impossible to determine how much restoration was actually required. In the fragmentary Adagio cantabile (which peters out rather ineffectively just as Wagner was clearly preparing to launch a new idea) Neeme Järvi allows the music more room to expand, taking a full minute longer over the stately progress of the material. Elsewhere, and throughout the First Symphony, he takes a very fast approach indeed, while Märkl allows more room for romantic development. This pays real dividends at the very opening of the symphony, a startling series of bold chords which expand on Beethoven’s technique at the beginning of the Eroica, and here Märkl allows for the silent pauses between each chord to register as a really original effect; Järvi, bathed in a warmer more resonant sound, blends the chords into each other like a more conventional thematic statement. One of Wagner’s most original touches in this symphony comes with the return of these chords, now bound into a melodic whole, at the very end of the finale just before the final series of cadences. The sound in Märkl’s account is clearer than in the resonant acoustic that Chandos furnish for Järvi but his more measured approach lends greater weight to the almost Brucknerian brass statements that enter almost immediately in the first movement. I am less convinced by Märkl’s almost impatient acceleration during the second movement (closely modelled on that in Beethoven’s Seventh) but the scherzo and finale both bubble with life. There is even more colour in the completed opening movement of the Second Symphony here, again at a more measured tempo than that given us by Järvi. On the basis of the performance of the symphonies alone, therefore, I would have little hesitation in placing this Naxos release at the top of the current recommendations (such as they are). But Chandos possess a solid advantage by providing two further rarities in the shape of Wagner’s later orchestral scores for the Huldingungsmarsch and the Kaisermarsch as well as the Rienzi overture. The last is neither here nor there, but the two marches are not be heard in their orchestral form on any other currently available CD so far as I can tell and the Heroic March written for King Ludwig is really well worth hearing. Wagner completists may therefore gravitate to the Järvi disc, and may not wish to consider the purchase of a second account of the symphonies worth their while. Those wishing to hear alternative performances of these works will however find Märkl’s accounts eminently satisfactory, and the recordings are lively and responsive. One wonders why it has taken five years for these performances to emerge on disc.